Another blog post about a Zoo? Yes, as you can see I really do love to visit those places. This particular Zoo is a pretty small one here in my hometown. During my childhood I have been there very often and in the past years also again several times with my wife and some friends. The best thing about this Zoo is that it is close by, really just 15 min by bicycle or 5 min by car. It has been found 1951 as a place where only animals from this region were shown. They kept this idea for a long time but later expanded and have now also monkeys, polar bears and penguins. The entire place is located within a part of the local forest which gives you a different feeling for the place than other Zoos which are normaly not so heavily grown into a forest. At least during my childhood the little shoats (baby boars) were able to squeeze below the fence and ran crazily around harassing visitors to give them some food. I don’t know if it still the case as I have been in the Zoo in the past years only during winter time. Another nice thing there is the Barbary macaque enclosure as you can enter it and walk on a path through. 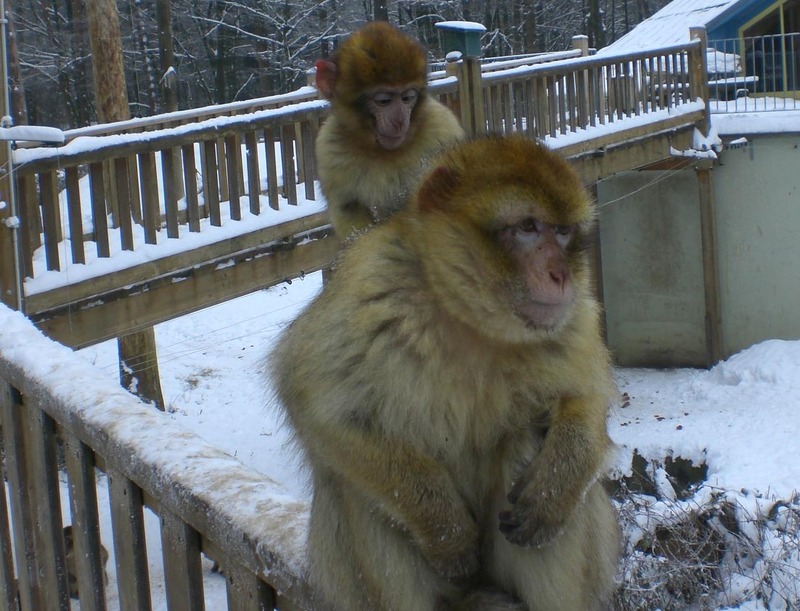 Usually all the Barbary apes will come to the path expecting some food or just try to grab anything you have in your hands. All the pictures are from our visit there in 2010. I believe it was the first time for me there in over 10 years and much had changed such as the new penguin enclosure and the monkey park. As you can see there are goats…many goats, too many goats! The goat world is located next to an old farm building and is very popular with the kids (nearly as popular as the playground). You can enter the enclosure and feed the goats but often you have to watch out that those demon animals don’t get too greedy as they might follow you later on through half of the park (did I mention that they can leave their enclosure?). Now that I think about it there are actually few animals enclosures you can enter and feed the animals with the food bought at the ticket office. Even though this is just a small Zoo with very limited funds they still manage to keep everything well maintained unlike the Chinese ones I have been to so far. The animals seem to be taken good care of and nowhere is trash to be found except of course the trash bins. Especially the trash thing however might be more related on the general attitude of the people as in China I even saw some throwing trash and even cigarettes on the animals. Gaots AND Geese chaising us! In May few Chinese friends from Finland will come over for a week or so and I had the idea to visit the Zoo with them. During that time also MIL will be still with us so we can just leave her in the goat enclosure as she seems to like it with those animals. Hopefully she will stay there for some time but I still believe dropping her at the Outlet Center for a week is the more effective way to get rid of her for a while. Do you know any small Zoo’s such as this one? What a cozy zoo. What, the goats can leave their enclosure and follow you around? Certainly good and bad to this. You might feel harassed by the goats, but then you might also get a new friend walking around the zoo with you 🙂 In the photo, you were trying to feed the evil goat? Yes, in the pictures I tried to feed them so they leave me in peace however right after that even more came begging for food. I am glad to hear that the zoo is well-maintained and the animals are well taken care of – it makes for a more enjoyable experience all around. I love seeing the penguins at the Taipei Zoo and once we saw the zookeeper feeding them. One penguin chased after the zookeeper to try to get another fish out of his bucket – it was pretty cool. Throwing cigarettes on the animals? Now, that is just plain wrong. It is too bad there are not stricter guidelines for visitors at zoos in China! The way you talk about your MIL makes me laugh everytime. I hope she doesn’t read your blog, or is the feeling mutual? Hehehehe, that would be awesome! I am looking forward to more pictures of that big furry pig. :DDDDD BEST BIT EVERRR. 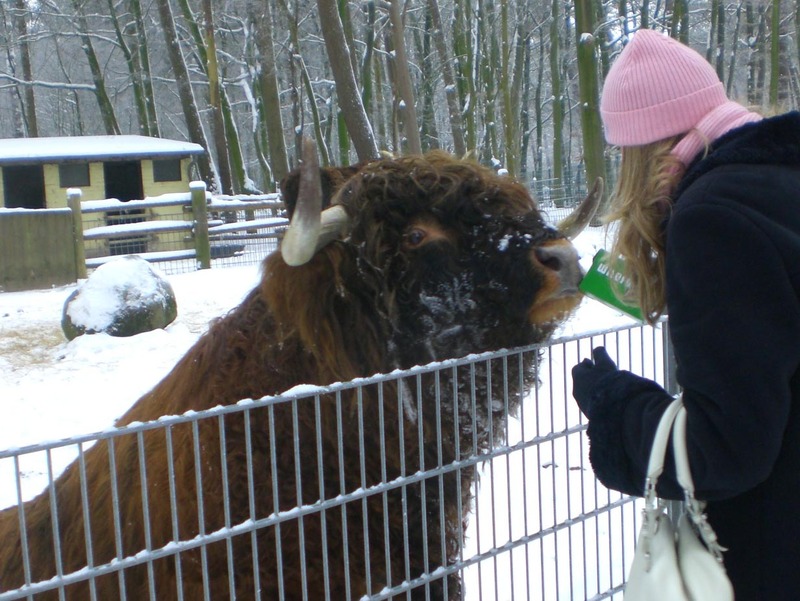 There are some wildlife parks (big, spacious areas) with only native animals in Sweden, but not really any small zoos doing the same thing. Well, I don’t have more pictures of that cute little pig but I will make sure to take more in May! 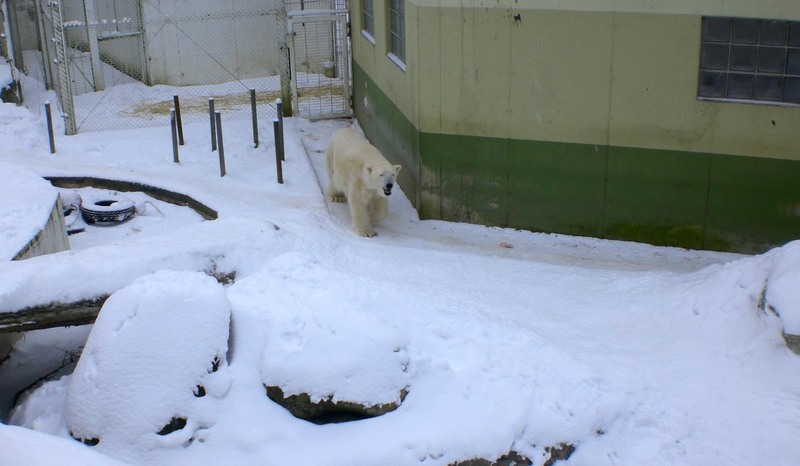 A zoo during winter time is interesting however many animals are hiding due to the low temperatures. I read somewhere that the Chinese in mainland China have a different attitude about wild animals…which results in that awful spectator treatment. I don’t usually like zoos but this one looks very nice! And with the snow and everything it’s beautiful! I only rarely visit zoos as caged animals make me sad. Though I guess zoos with the purpose of preserving endangered regional species are ok. I’ve heard a lot of horror stories about the zoos in China..
You can get that close to the monkeys?? Wow! 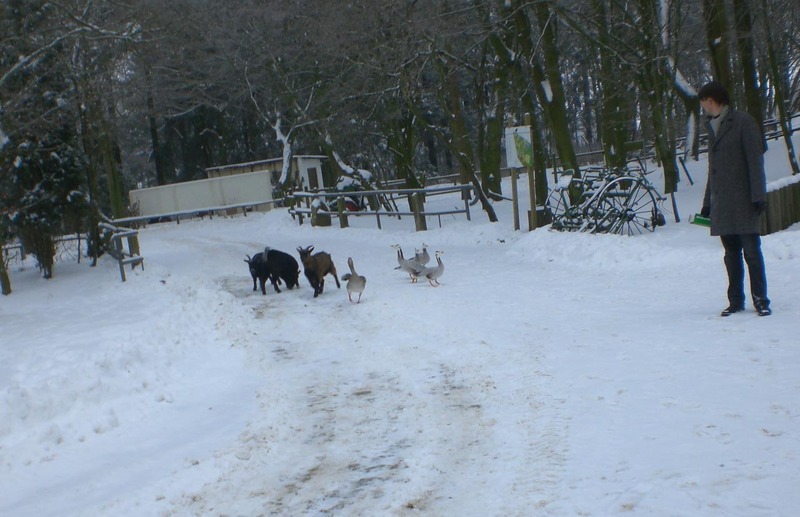 Those poor animals amongst all that snow …. Brrrrr…. we feel cold for them. We do have a few smaller zoos but none that are close to us. Is that weather getting warmer yet? It is pretty interesting to go that close to the monkeys, especially because they often try themselves to get close to get some snacks!